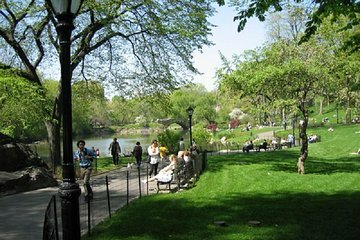 Honored as a National Historic Landmark and with the distinction of most visited urban park the United States, Manhattan’s Central Park offers a peaceful green oasis in the midst of the bustling city. Meet your native New Yorker guide at a convenient park location midmorning, and begin a leisurely stroll along the park’s meandering pathways. Covering 843 acres (342 hectares), the park could easily take weeks to explore and can be overwhelming to first-time visitors, but your guide will lead you to the most beautiful pockets and famous landmarks for a relaxed experience. Depending on the time of year you visit, see locals enjoying their Sunday with picnicking, bicycling, jogging and ice skating, and pass by iconic gardens, meadows and bridges you may recognize as the real-life filming locations of many movies. Step outside the limits of the park to explore the surrounding neighborhood of the Upper East Side, one of the oldest and most luxurious areas of Manhattan. Admire stately apartments, hotels and boutiques that line the broad avenues, and learn about the history of the neighborhood. After 2 to 3 hours of walking, depending on the mood and pace of the group, say farewell to your guide and set off to enjoy the rest of the New York Sunday afternoon on your own. Bill is a great guide. Informative and congenial. Good pace to the tour. Took this tour 5/6/17. Will take more tours from him when I return to New York. Excellent guide who gave an informative commentary to our morning stroll through the Park and Upper East Side. Probably helped by a beautiful sunny November day.